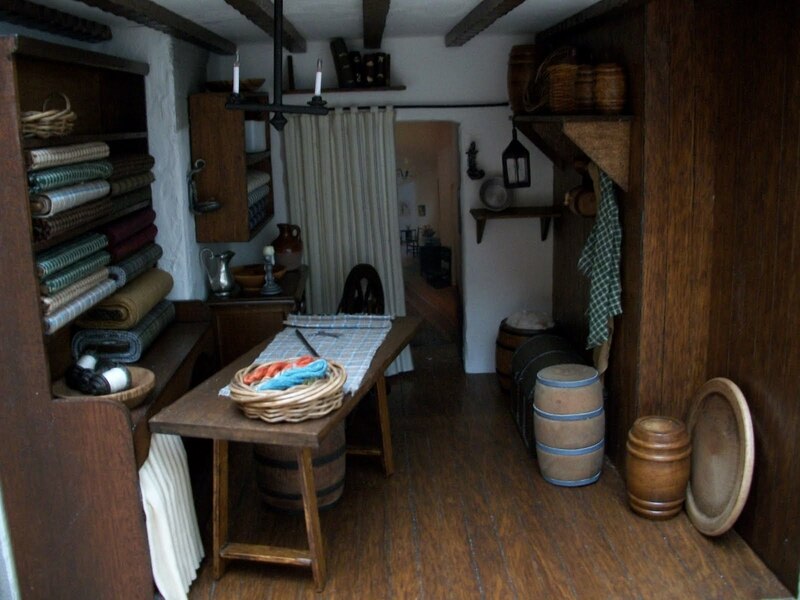 The Tenement: The Cloth Merchant's Booth ("Luckenbooth") is finished! The Cloth Merchant's Booth ("Luckenbooth") is finished! 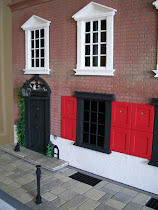 It occured to me today that I hadn't actually shown the finished Cloth Merchant's Booth. I seem to have got so carried away starting the kitchen and completing it then starting on the next room that I forgot about this one. I'd been holding back posting this picture because, at the back of the room underneath the shelf in the real building there was a black object I couldn't make out in the pictures I had so it meant a quick visit to check it out. I had to smile when I got there because the black object that had been bothering me so much turned out to be a wooden affair used to disguise a radiator. Of course, we can't be seen to be showing a radiator in a 17th century building. I just have one or two items left to get as shelf fillers but on the whole, this is finished. This booth is just perfect! I can almost hear the merchant talking to the customers, the noise of ladies outside going shopping, the clatter of pattens on the footpath . . .
Irene, your scenes have so much presence, and in some gentle intangible way are so Scottish, without resorting to cliches! I am in awe. Es una preciosidad de tienda. Me encanta el color de la madera, se ve tan real. Puedes imaginar el ir y venir de la gente, mirando los tejidos. Te ha quedado maravillosamente bien, me encanta. Fantastic job!So realistic!I love all you have created in this room! It is so realistic. I love all the little details you took the time to add. Very nice work! Your story about the radiator made me laugh. I really like your booth, Irene, very realistic! What color wood stain did you use on the furniture and floor boards? For Chris - Thank you for your nice comment and apologies for not replying sooner. I use Quick Drying Woodstain in Dark Oak for my floors and furniture. Hope that helps. Thank you so much Irene, that helps a lot because I have the exact color in a Rustins tin.